FREE! Magazine » Stereochemistry – Märka! 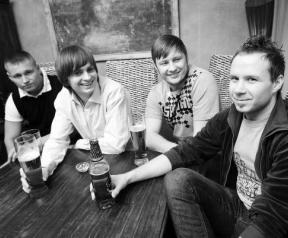 Stereochemistry is a young new band from Tartu that has just released their debut studio album Märka! after having played together for about 4 years. Following their musical dream and taking advantage of having reached the finals of Eesti Laul 2009, the Estonian foursome formed by Holger and Siim on the vocals/guitar, Indrek on the bass and Keio on the drums deliver 11 shots of good rock in a notable first effort to break through the Estonian music scene. The first couple of tracks, Ainult armastus on ju päriselt meie and Öösiti kõndides, give a good sample of what you are going to find in the rest of the CD: smart lyrics, edgy riffs and pop-rock rhythms easy to follow and dance to. Holger vocal skills suit perfectly on the songs, although maybe it would be nice to notice a bit more of experimentation on his notes, because most of the songs are sung at the same vocal levels, not putting his throat at risk. The orchestration sounds fluent and compact, highlighting the excellent skills of Keio, the drummer, who really pushes the songs higher and higher with his effort, something you can really notice when the band plays on live. I had the chance to see them during the presentation of their album at PlinkPlonk Club in Tartu, where you could really notice that the tracks work perfectly well on stage, with the audience having a good time and getting warmer and warmer song after song. The fourth track Märka!, homonymous of the album title, marks a perfect inflection in the album, sounding slower and a bit sadder at the beginning to explode later in a hooky chorus, being impossible not to feel moved by it. On the other hand, the most melancholic moment of the album comes maybe by Eile, although the band never let themselves fall into the dark and more twisted side of pop, and add in every song a colorful note of hope and fun. Different to the style of many similar styled Finnish pop-rock bands that choose a darker and more melancholic style, Stereochemistry bets for the lighter side of rock, songs to enjoy at a gig or a party with good friends and a beer in a hand, while moving your feet. If I have to put a “but” to the album, I would say that the artwork of the CD and booklet feel a little bit too amateurish, but being this the debut work, is a detail totally forgivable. The question to decide is if the band will be able to break through from playing in small venues and pubs to bigger audiences. Their style, a bit similar to other Estonian bands that were able to become mainstream like The Smilers, is perfect to catch the attention of the masses wherever they play, and luckily there are venues enough in Estonia to welcome them on stage around the country, but if they just do not want to be labeled as just one more Estonian pop-rock band, maybe they would need to go a bit more experimental and risky in follow-up works. For the moment, Märka! represents a very good promising debut for the young guys!